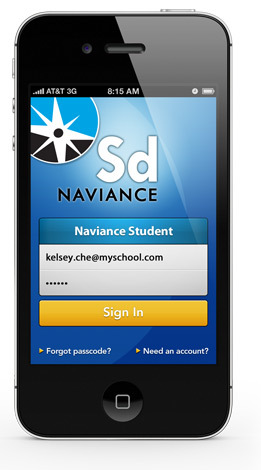 You Can Now Download the Naviance Student Mobile App!!! In high school, you will be involved in various academic, community, and social activities. Each of these activities will provide you with a wealth of experiences and help you clarify your interests, goals, and plans for the future. Active involvement in high school is one key to a successful and rewarding high school experience. Get involved, take charge, and become the best student you can be. As you and your parents plan your program, your professional school counselor is available to help you every step of the way. Naviance is designed to provide you with information about time management and study skills improvement, decision making, career information, college planning, and college admission tests. Getting started with an assignment or work can sometimes be a problem. However, if you put into practice ideas from this site, you may find that your high school years will be more rewarding! Please ask your counselor for additional materials or clarification about information on this site. Welcome to High School! Many things may be going through your mind as you prepare to enter high school. You may be overwhelmed by the size and diversity of your campus, the desire to make new friends, the worry of academic success or failure and graduation requirements, creating positive relationships and a winning self-esteem, and just trying to find out what you need to do to survive your first year in high school. We want to help you be successful in your classes and in transitioning from middle school to high school. 1) Parents/guradians with an updated email address in Powerschool will receive an email containing their password and directions to register; This email was sent 9/25/17 for parents/guardians of current 9th graders. 2) Students can login to their Family Connection account and access the message containing the parent/guardian registration codes. We are truly excited about the opportunities and experience this tool will provide our students and families. We take pride in supporting our students with their journey in developing their academic and social potential. Early planning can guide students’ experiences in high school and help them make informed educational decisions.